I've closely followed John Jackson Miller's comics journalism for a number of years now, and particularly found his work for the Comics and Games Retailer to be both insightful and refreshing. While others tended to scream that "the comics market is doomed" or that "there's gold in them thar racks" without nary shred of evidence besides anecdotes, John J's level-headed approach to discerning what the industry sales figures probably were, and what trends these numbers actually revealed, were a welcome shot of cold, hard factual reportage. 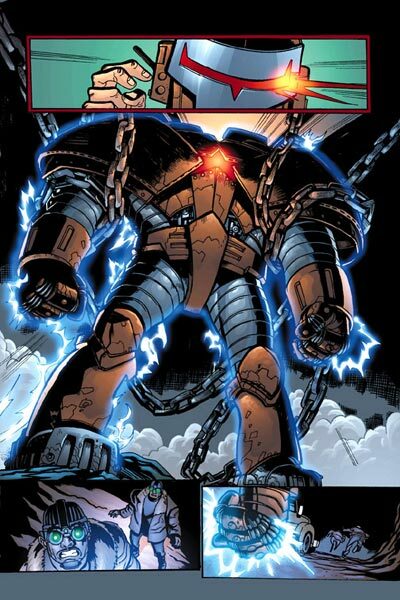 So when I heard that he'd successfully taken Marvel Comics up on their offer to pitch a new series -- which turned out to be Crimson Dynamo -- for their revival of the Epic imprint, I was happy for him ... but also a bit worried that he'd be leaving his post at Krause to concentrate on this new career. Then, when he accepted the scripting chores on Iron Man, I really began to wonder if the end was near for his stewardship of the venerable CaGR magazine. However, I soon discovered that my worries were groundless, as Miller explained to me that he fully intends to continue working full time as an editor for Krause, with no let up in his burgeoning work load, while simultaneously producing scripts for those two mainstream monthly titles. The story of how all this came to pass, and the behind the scenes approval process at his "day job" that allowed it all to happen, make for a read that's almost as interesting and full of plot twists as the scripts he's been producing for Marvel. Bill Baker: You've recently begun writing two ongoing series for Marvel. Was it an easy decision to take on those two assignments, and what were some of the pros and cons of doing so? John Jackson Miller: My job as editorial director of Krause Publications' comics and games division had been evolving over the years to the point where I was doing very little writing, and spending far more time managing our burgeoning line of books and specials. So, when offered the opportunity to pitch a series, I may have been more willing to try it than in the past, when I was more involved with the periodicals. I'd been finding I had more creative energy left over at the end of the day, and was already brushing up my fiction and comics writing at night. Before I could even begin writing, of course, I first went through all the proper Krause channels for taking on outside work. Active participation in one's hobby areas is encouraged at the company, but I still wanted to go through the necessary hoops. That may have delayed my sending in a submission, but it was important to me to have those approvals. 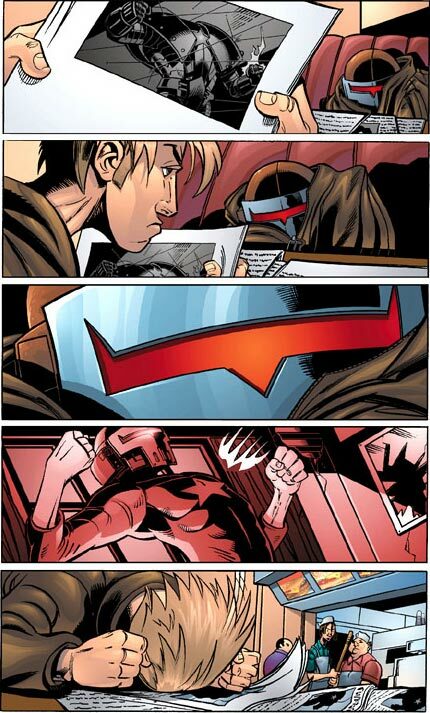 The pros were obvious; experience on the creative end of comics at this level was something I didn't already have, and anything I learned about the process would certainly be to the benefit of readers at Krause in the long term. And certainly the exposure helps the recognition factor of my other books. The cons were basically, as we perceived them, scheduling issues involving my own time. We've worked to arrange things so I can get everything done. BB: With your full time position at Krause, isn't this all a conflict of interest in a real sense? JJM: As noted, I'm almost entirely working on books today. I'm hardly going to modify Craig Shutt's Baby Boomer Comics to give a more favorable response to Professor Xavier's 1963 confessed crush on Jean Grey, or to boost the back issue prices on Crimson Dynamo in the new Standard Catalog of Comic Books. And I trust Maggie Thompson and her staff will follow the policies we've had in place back since she was writing Dark Shadows for Innovation: Our magazines won't initiate coverage of my work (unless I end up revealing where Osama is or something so newsworthy it's unavoidable). If Marvel initiates the coverage in a press conference or something (as it already has once) or if a freelancer reporter/reviewer initiates the coverage, then it's fair game. Our readers shouldn't suffer a complete blackout on any title I'm involved with, but neither will there be questions that Krause is giving me - or I'm giving Krause - an unfair advantage. BB: Well, you must have a lot of free time at the day job if you're ready to take on another full time work load. JJM: [Loud laughter] Both my publishers and their readers get their money's worth. And so will my four-year-old's psychiatrist, after many more years of my moonlighting! BB: So, what's your typical day at Krause consist of, then? What does an editorial director really do? JJM: I come up with the giant projects we're not doing already, and then figure out ways to get them done. This involves getting financials from my publisher, then figuring out how to allocate the labor -- whether it's drawing on freelancers, our internal staff's marginal time, or my own elbow grease. This year, for example, has involved two things we've never done before: second editions of the two major books I've launched, the Scrye Collectible Card Game Checklist and Price Guide and The Standard Catalog of Comic Books. The first editions of each were monumental undertakings, and there's something about first editions in that you don't always do everything in the way that best facilitates doing future editions. You're always trying to get that first book out, not worrying about whether your workflow is going to make the tenth edition any easier. Each book increased in size by about 200 pages and included new features and sections, and I had to figure out how to get the databases to deliver. The Scrye book did very well in its hobby earlier this year, and the Standard Catalog is finally off to press at a whopping 1,464 pages, which is very nearly double the editorial pages of its major competitor in the field. I think people will find it has just as many new bells and whistles as the first edition introduced. BB: Does this mean that you'll be jumping ship, or do you think you can continue to "serve two masters" faithfully and well for an extended period? JJM: As someone employed in publishing, my masters are ultimately my readers, whoever delivers the words. I always think about serving them, first. But less evasively, I very much enjoy the differing tempos of the work I'm doing. It's refreshing to spend the day thinking about photo covers on western comics from the 1950s - and then think about tomorrow's comics at night. BB: Man, you must have the most understanding and supportive wife in all of Wisconsin! JJM: I met the intrepid Meredith through Comics Retailer, as it was called then, my first year on the job. She was Meredith Woodwell then, manager of Zanadu Comics in downtown Seattle. Somehow I disguised my major flaws and we're about to celebrate our seventh anniversary. Her equivalent thirst for comics has translated to encouragement, most of the time. Until I forget the time and sit up writing until 3 a.m., that is. BB: What does the editorial work give you, aside from a steady wage? How satisfying and fulfilling is it for you, personally and professionally? JJM: As noted, it really does give me a chance to think about some other eras - and other hobbies, as games are fully half my job there. And it also draws on some of my other skills. I get to put my statistical education at work now and again in analyzing comics sales trends over the years. My understanding of newsstand sales techniques comes in handy when looking at cover designs for our mass-market magazines. And my days as a high-school computer geek have helped me get a handle on the massive database coordination chores we've had to take on. BB: What about the creative work? What does that give you that you don't get from the day job? JJM: Oh, quite a bit. I used to review comics for the magazines years ago; now it's kind of put-up-or-shut-up time, an opportunity to put into play some of the theories I've developed in the past decade about what makes comics enjoyable. In Crimson Dynamo, for example, I've tried to make each episode enjoyable on its own - even though it's clearly part of a larger story. I've tried to hide "Easter eggs" in there that will be rewarding not just for the longtime Marvel continuity readers, but for people familiar with the setting - while at the same time making it so that they won't distract new readers. I've tried to put in a little fact or two so people will come away with a few facts about Russia - while integrating them in an approach that's matter-of-fact and not preachy or overtly educational. 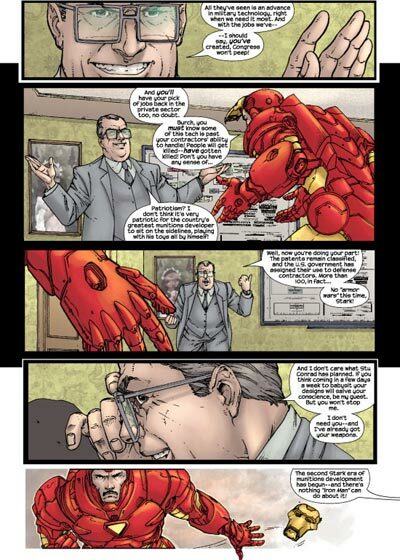 And in Iron Man I've sought to take a familiar character and insert him into a new situation - almost in a "thought experiment," to see where his personality will lead us. What are Tony Stark's politics? How would the world react to him in a leadership role? These are the sorts of questions I've always wanted to see comics tackle. So I'm taking my own advice and seeing how it goes. 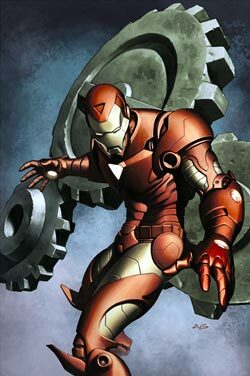 So far, so good: feedback from fans to Crimson Dynamo #1 last weekend at the Big Apple convention was really gratifying. JJM: Ummm. just that lettering in Russian is hard. We're doing all the background "props" in the actual language, not fake lettering - and the same Russian words just won't fit in the same space of, say, the equivalent English ones. The word "misanthropic" alone is 24 characters long (transliterating to something like "chelovekonyenavistnicheskiy")! I keep threatening the letterer with a story set in China. For more information on John Jackson Miller's Marvel work, go to www.marvel.com; for more on his editorial work at Krause Publications, visit their website at www.krause.com.